I’ve been reading cancer stories and it is said that you’ll never get back to your “old self”, so you’ll need to readjust to a “new normal”. It is a big leap. Sometime next week, we’ll know if the test results are clear and if she can get away without chemotherapy, preventive or not. If so, then our family is rather lucky to have two members survive cancer with just surgery alone. I also had ovarian cancer in 2011 and survived with just surgery alone. There were large tumours in both my ovaries. They were so gigantic, the ultrasound machine couldn’t even measure the size. It’s due to my surgeon’s brilliant skills that both my ovaries were left intact since one tumour was as large as a jackfruit. In many cancer cases, chemotherapy is unavoidable. Some cancers are not contained and spread easily. Some cancers manifest in inoperable spots. If Elise’s tumour was significantly smaller, the treatment of choice would have been chemotherapy too. Chemotherapy is a toxic cocktail which when inserted via IV, kills not just the cancer cells but also many healthy cells. I do know of many cancer survivors who have been through chemotherapy and are leading regular lives too, one of them being Evon, who is mighty strong. She can write her own book on surviving an aggressive cancer. This is Elise’s current favourite. 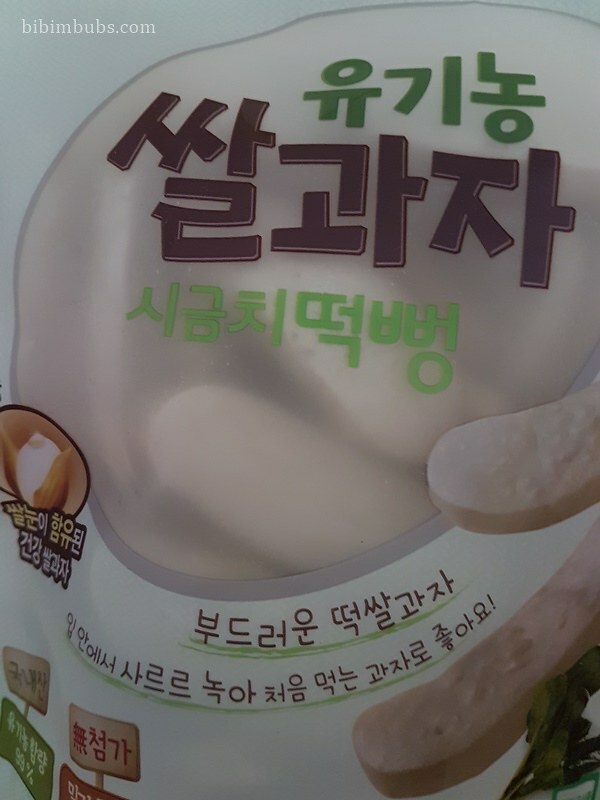 Elise tried these when we were in Korea so I got my friend to send two cartons over. Now we have enough for the whole neighbourhood. These are organic rice crackers without additives and come in spinach and sweet potato flavours. Elise never says no to these. She has more or less recovered from her cough and since her stitches were removed, all we have to do is administer eyedrops four times a day which isn’t as traumatising (for me) as squeezing in ointment between her sewn eyelids. Her swelling has also gone down visibly and (dare I say it?) she looks a bit more like her old self. The temporary conformer that Dr Ganga placed appears to be totally black. We’ll be creating a prosthetic eye for her. There’s a little issue though because I’ve heard that there’s an experienced doctor skilled in creating prosthetic eyes, but she’s based in Khoo Teck Puat Hospital. I’ll need to ask how we can go about doing that while continuing to follow-up in NUH. Children pick up things at the speed of light, so it is necessary for us as parents to be very aware of our actions and behaviour. 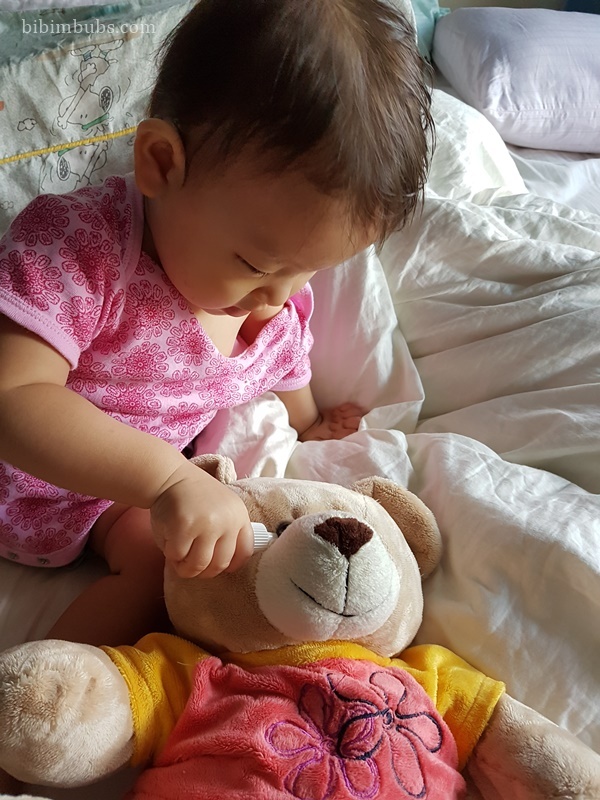 Here she is, administering eyedrops for her bear, whose eye she plucked out and tried to eat. My father found the screw like plastic eye in her mouth and dug it out. This bear is now eyeless but it’s still Elise’s current favourite. She kisses and chomps its nose, gives it an obligatory hug before flinging it aside to read her book. She also likes kissing her books. Over here, she’s imitating how a puppy behaves. 🙂 She’s also able to identify the animals behind her book and likes to hold our finger to point out the correct animal when asked. I don’t know what she feels about losing an eye or how she’ll react when she grows older, but she does seem to have a bright, cheery personality which will be able to take her through storms.